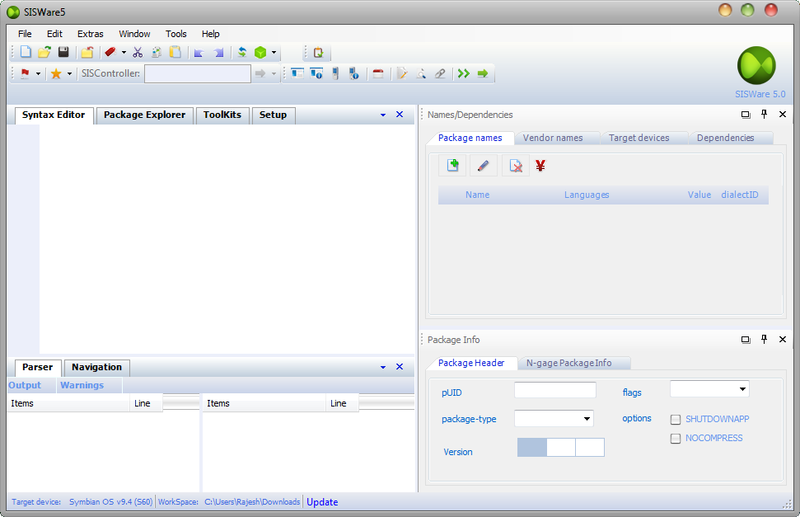 SISWare is an application that helps to edit SIS applications and create installation package. It is used to combine multiple sis files into a single sis file. It also allows you to open any SIS file or the PKG script file and rebuilt, extract any single or multiple files from the SIS package. It also support editing of N-Gage applications and setting up the application for various targeted devices along with vendor name and language. It allows you to Browse, Analyse and Unpack any Symbian Application file or Game. It supports Batch SIS file Extraction. It allows you to edit SIS file or PKG script and rebuilt the installation package. You can also compile SIS file and PKG script. You can built SIS file with multiple options. It also allows you to sign and unsign sis file and create self signed certificate file. It allows you to Setup UID, Vendor name, Language and Target device. SISWare is compatible with Windows XP, Vista, Windows 7 and Windows 8. In case you are unable to open the application properly, then you have to setup compatibility mode to Windows XP service pack 3 from the application shortcut. The above requirements is recommended for general use. The speed of data rendering may differ with RAM and CPU speed. Software Author: Cequenze Technologies Inc (this is the last and final release). Note: SISWare 5.0 is a portable application, which means you do not have to install the application on your computer to run it. Simply extract the downloaded .zip file on your computer and run SISWare5.exe. There is another SIS file editing software called SISContents, it also works same as SISWare, you can use is as alternative software. In case you want to edit Nokia Firmware files then you can use Nokia Firmware Editor. It’s really the best tool for extracting resources from SIS files. I tried unsis, siscontents, sisexplorer, yamgui plus, but SISWare to my mind is the best choice!